Waiting on Wednesday is a weekly meme/feature hosted by Breaking the Spine. It's a way to highlight the up-and-coming book releases you are looking forward to grab. 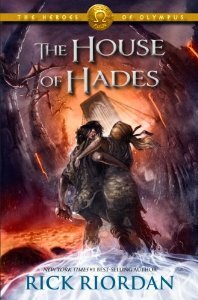 I liked the first two of this series ok, but it really picked up in The Mark of Athena and I loved that book, and just as things were coming together...A MASSIVE CLIFFHANGER! I'm ready to find out what happens. Yes! I featured this one last week! CAN'T WAIT! Great choice! Im a HUGE FAN of Percy Jackson! Anyways besides your good taste in Wow books aha, I’ve been reading for posts and I seriously put 3 books in my TBR shelve so thank you for that! New follower! Jessica, Love finding more Percy Jackson fans! Not to much longer thankfully. :-) Thanks! And thank you for stopping by. Kate, It does! :-) I can't wait. Mandi, can't wait to see what everyone thinks when it is released! Thankfully the wait is shortening. :-) Thanks for stopping by! Shirin, Yay for more Percy Jackson love! It is a fun series. Cant' wait to see how everyone likes it! :-) I'm glad you've liked my WoW books. Thanks for your link, I'll check it out!